Raymond D. “Ray” Zinn is an inventor, entrepreneur, and the longest serving CEO of a publicly traded company in Silicon Valley. Zinn is known best for conceptualizing and in effect inventing the Wafer Stepper, and for co-founding semiconductor company Micrel (acquired by Microchip in 2015), which provides essential components for smartphones, consumer electronics and enterprise networks. He has served as Chief Executive Officer, Chairman of its Board of Directors and President since the Company’s inception in 1978. Zinn has led Micrel profitably through eight major downturns in global chip markets, an impressive achievement. Many chip companies weren’t able to make it through one downturn and very few have survived through all the major downturns. Micrel has been profitable from its very first year, aside from one year during the dot-com implosion. 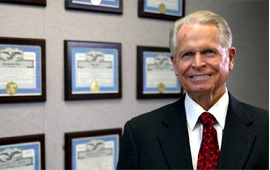 Ray Zinn holds over 20 patents for semiconductor design. He has been mentioned in several books, including Jim Fixx’s The Complete Book of Running and Essentialism by Greg McKeown.